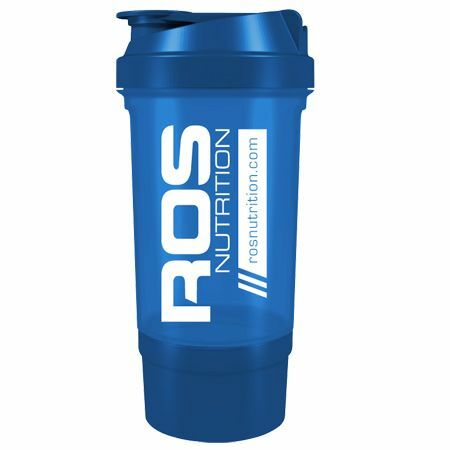 This ROS shaker with the protein cup helps blend and prepare both pre and post workout protein shakes in an effective manner. The meshed grill in the shaker avoid any limping of the powder and ensures that you get the perfect taste and texture from your protein powders. A leak proof sure seal screw cap and the secure screw on cap ensures there is leakage or wastage of the shakes. The bottle also contains an etched milliliter measurement to make sure your mixing is exact. Before first use: Wash with lukewarm water and detergent before use! Cleaning: Wash with lukewarm water and detergent. Warning: Do not use with carbonated fluids! Not to be cleaned in dishwasher.